Reveal your superhero, take the online "BE INCREDIBLE, Reveal Your SUPERhero! Pledge Against Bullying." 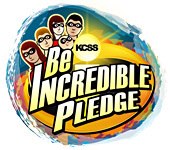 KCSS stands on the belief that every student has incredible super skills and talents that make them unique and strong. By taking the pledge we are working together towards creating a "family-like" culture in our schools and community. Strong and make good choices to improve myself and my school. Understanding of others and realize everyone is unique with varied talents. Powerful by reporting to an adult, or sending an online tip. Encouraging when a fellow student needs reassurance. Respectful of others and treat everyone as I want to be treated.